A council has said it will remove "anti-homeless" bars from benches after receiving "extensive feedback". Protestors including rapper Professor Green condemned the bars as "inhumane", "brutal" and "disgraceful". 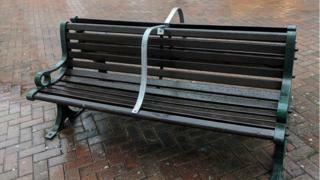 Bournemouth Borough Council said it had fitted the devices to stop people lying on the benches and preventing others from sitting down. It said it would remove them in the next few days, in the light of "the depth of feeling" over the issue. More than 19,500 people signed an online petition calling for the bars to be taken off. The housing charity Crisis said the benches were a "sad indictment" and failed to "address the root causes of rough sleeping". Professor Green, who last year fronted a BBC documentary on homelessness, said the benches sent a hostile message to "poor sods with no safety net". In a social media post, he said: "Nothing done to tackle the problem, just something to make it more invisible so we can pretend it isn't happening." On Monday, protestors festooned the 28 benches with throws, cushions and balloons. Bournemouth Borough Council later announced its change of heart. Councillor Robert Lawton said: "The decision last summer to install the bars on a very small number of benches... was taken in response to many complaints about people lying on them throughout the day. "However we have listened to the extensive feedback over the last week and in light of the depth of feeling, have today reviewed that decision and agreed to have the bars removed." Artist Stuart Semple, who prompted the protests by posting a photo of a bench in January, said he was delighted. "We're totally over the moon, it's brilliant... It just really goes to show when the community comes together, gets behind something and keeps the pressure up." 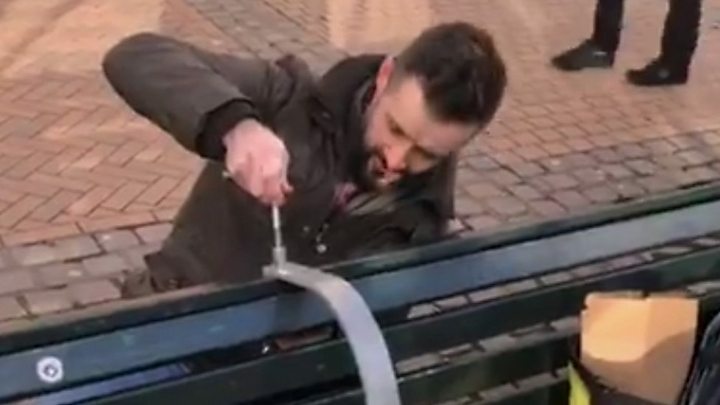 Professor Green, who filmed a friend removing bars from a bench on Thursday, posted: "Well done all involved... A small example of how a little bit of togetherness can bring about change." In June 2016 Bournemouth Borough Council bought one-way train tickets for rough sleepers to help move them out the area. And in 2015 the authority played Alvin and the Chipmunks songs and bagpipe music from speakers at Bournemouth Coach Station between midnight and 06:00. The council said it spent £10m on homelessness measures each year and "continues to maintain that as a society we should be aiming far higher than a bench for people to sleep on".